I am very much new to amplifiers and speakers of this level. I bought Denon X4500H and Klipsch RP 8000F + R 115 SW just this week. I am reading through a lot of stuff online about best settings to get the best out of the system. I agree that what I like is the best sound for me, but just to have some basics clear, I need some help from the community. I am using the whole system for music listening only. No movies or TV at all. I read about LFE, LPF etc and tried to play with setting the mains to Large/ Small LFE/LFE+Mains and LPF - 120Hz but I do not seem to feel any difference. I was expecting R 115SW to explode my room but its still very nominal. Could you please help me out with some basic settings. I bought Denon X4500H and Klipsch RP 8000F + R 115 SW just this week. Hi Vivek, welcome to the Klipsch forums. All of your equipment is excellent. I want to focus on your Denon 4500. It has a lot of advanced settings which can greatly affect the sound. Have you run Audyssey yet? After you have run Audyssey we still have a lot to talk about, but it is an excellent starting point. It will help synchronize the speakers and sub so the sound gets to your ears all at the same time. I am very much new to amplifiers and speakers of this level. I bought Denon X4500H and Klipsch RP 8000F + R 115 SW just this week. I am reading through a lot of stuff online about best settings to get the best out of the system. I agree that what I like is the best sound for me, but just to have some basics clear, I need some help from the community. I am using the whole system for music listening only. No movies or TV at all. While I am sure the Denon is a very nice AVR and does 2-channel adequately, I am very surprised you did not decide on a dedicated stereo rig since your system is for music only. Some stereo systems(integrated amp, stereo receiver, stereo separates) have the option of adding a subwoofer and room EQ. Odds are you do not need a subwoofer at all. A general rule of thumb is to cross the mains to the subwoofer about 10 Hz or 1/2 octave above the bottom limit of the main speakers. For the RP-8000s I would suggest 40 Hz if they are against a wall and 50 Hz (~1/2 octave) if they are not. 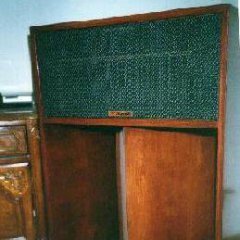 The sub should be in the corner to achieve the low frequency performance Klipsch specifies. Buy a decent sound meter to calibrate/check the balance between the mains and sub. If your receiver has Audessey, try it. It sets my sub crossover to 42 Hz for my La Scalas, too low. Thanks all for your inputs I guess the first thing I should is run the audyssey. Congrats, nice set of speakers. I would concur with JohnA; run Audessey with speakers set to small + sub. Check the results and then you can experiment. These speakers have similar frequency response to my Ohms which I would cross over at 40. Worked well in this room. Over time I found I didn’t really need the sub all the time anyway and would switch over the setting to large and drop the sub. All about how they interact with your room. Enjoy!